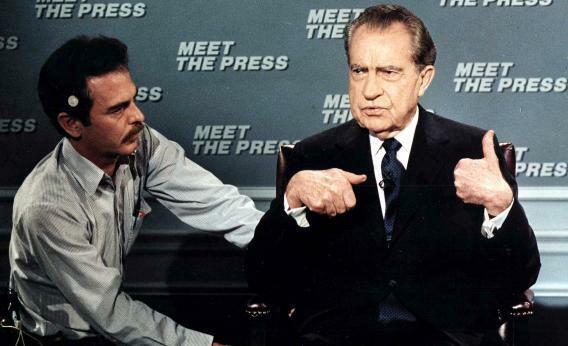 WASHINGTON, : This file photo shows former US President Richard Nixon (R) as he gestures while being wired for a microphone by an NBC technician 09 April 1988 in Washington, D.C. before the start of the taping of the television show ‘Meet the Press’. It was the first appearance of Nixon on the show since 1968. When Nixon was asked about the current political campaign, he called Jesse Jackson ‘a poet’ and Michael Dukakis ‘a word processor’. Chock full of lurid details and choice recordings of Nixon ranting in the Oval Office, the piece seems driven by frustration that the 37th president succeeded to a certain extent in reviving his image after resigning. After all, Nixon wasn’t radioactive enough to keep Newt Gingrich, a rising star and leader in the GOP, from seeking the former president’s advice as he plotted the 1994 Republican Revolution.